Just make sure you look after you. Partying and academics can both push you into some unhealthy habits. College years are a long haul. Stay healthy! Shockingly, I liked cafeteria food. Several choices of entrees at every meal. Desserts. Soda, juice, even breads and cereals. It was great. Someone else cooks, someone else does the dishes…what’s not to like? I ate breakfast my first week as a freshman, before I realized that those 30 minutes were much too valuable for sleep before my 7:20 class. Then, one semester, I tried to save money by taking a 10 meals/week plan. I was dropping weight pretty fast and they agreed to bump me back up to the higher plan. There was a really big difference in the definition of fun between the two colleges I attended. Every college kid wants to have fun, but not every college kid chooses to honor God in the process. Sure, that's true at Christian colleges and all colleges, but I'm just telling you what I saw. It's hard to describe how electric it feels to pursue fun with godly boundaries. A lot of people wouldn't believe it. There should be a difference, though, if there is godly character involved. I'm telling you, there absolutely is a difference. Christian young adults still have a lot of growing up to do, and they mess up routinely, but they tend to recognize the cost of sin on their future. Blaise Pascal said, "The sole cause of man's unhappiness is that he does not know how to stay quietly in his room." I don't believe that Christian kids should spend their lives sitting quietly in their rooms. But the Holy Spirit helps us deal with the restlessness that gets us in trouble. The Christian virtue of self-control helps us know where to draw the line. 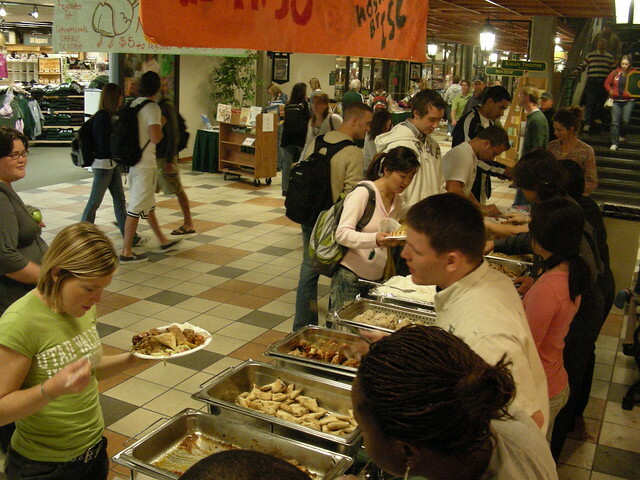 Got any interesting stories/observations about your college cafeteria? Or...how does/did the fun meter work at your school?